XXXXIII World Cup bandy had finished in Sandviken, Sweden this Sunday. 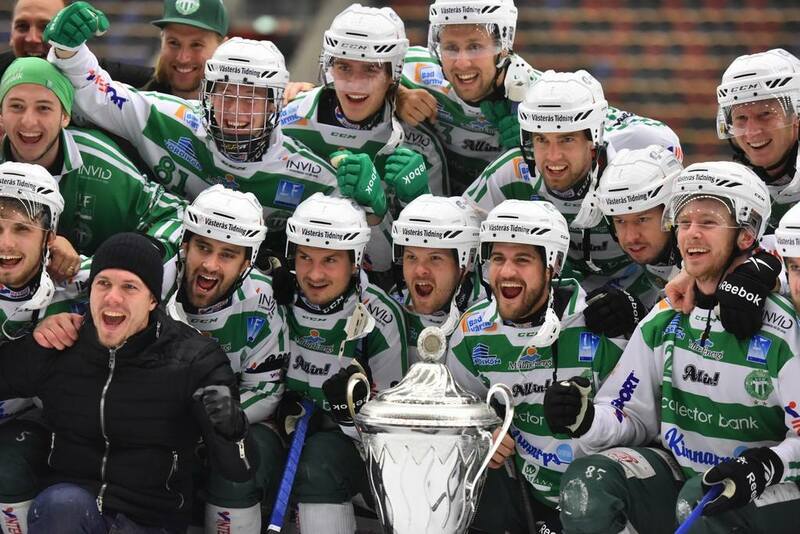 Champion of Sweden Västerås SK gained its 7th title of the strongest club in the world beating Villa Lidköping BK 4:1 (2:1) in the final and thus became the absolute leader by number of trophies. It seems that one and a half of decade of the russian dominance on the world bandy stage goes to the end. Evidence of this is not only a keen outflow of players from Russia among which are those of the highest world level but also that is more obvious the lack of game concept that russians could offer global bandy community related to the current circumstances. One of the last of multimillionaire clubs still remain in Russia is SKA-Neftjanik from Khabarovsk that arrived in Sandviken as a clear favorite by bookmaker rates, however, could not come over semifinal hurdle losing to Villa Lidköping 3:6 (0:2). Moreover conceded twice, including the group stage, both times were not accidental. The game concept of Villa was more perfect. Thus, financial investments done by the Far-eastern club into their results remain to be ineffective while their poor trophies that have been conquered over the past few years clearly do not satisfy ambitions neither sponsors nor the home audience. Another one russian favorite of the tournament and winner of the last year’s World Cup Enisej from Krasnojarsk, in its turn, did not lose a single game to any of swedish teams, although its rivals in the group were such grandees as Bollnäs GIF and Vetlanda BK. Enisej went off the group from the first position but proved to be completely beaten in ¼ final by its main competitor on the russian stage SKA-Neftjanik 1:5 (1:1). Siberian club by various reasons lost its 3 top leaders who defined the game path and no one of the talented youngers can replace them today doing this as effectively as they did it. Moreover Enisej miscounted in terms of bringing its physical conditions to a peak just by the World Cup which they used to do successfully in recent years. One of the world’s best players Sergej Lomanov was apparently not satisfied with results of his new club. IFK Vänersborg has not become automatically the top team after acquired Lomanov-junior, Ivanov and Bulatov. The thing is that russian stars continue to play rysskij hockey in their new club as they did it in Enisej and Dinamo-Moscow while the swedes themselves are committed to the classic swedish style that is more peculiar them. In this situation a lot depends on the IFK’s coach legendary Stefan Karlsson whether could he find common grounds with all his players convincing them to follow some new jointly developed concept of the game because neither the old swedish model or new russian one no longer work separately. One has to say a few words about the host team Sandvikens AIK. This is a superclub which has been both lucky and not at this World Cup. Immaculately passing through its group stage SAIK could be fired already in ¼ final but got off a stage later in ½ final. Half-disassembled Västerås was a bit more assertive and successful than Sandviken. But this defeat is not upset because SAIK introduced the world to an amazing game model, a prototype of its future high-standards wins. Its game has become faster and more diverse thanks to, first of all, a top class acquisition from Enisej. Alan Dzjusoev flashed in SAIK with new bright faces revealing his new talents as a vivid example of how the great master found himself in new bandy environment. Swedish game model of Sandviken was enriched by his appearance with elements of rysskij hockey becoming more memorable and effective in its tactical diversity. Well, to hone and bring it to perfection is a task that can be reached in the very near future. In general the practice of the World Cup confirmed the fact that success comes to those teams that develop and approve their own game concepts based on original ideas and capabilities of their schools. A clear proof of that is an example of swedish Vetlanda which has no other resources than well functioning system of their own bandy school, including the coaching one, where Jonas Claesson is left actually nothing else as to work only with the material that is regularly supplied by Vetlanda’s junior and youth teams. In Edsbyn, for example, a local bandy school is also listed on the highest level but, in contrast to Vetlanda, Edsbyns IF stubbornly continues to play old fashioned bandy isolating or unwilling to follow the modern trends. As a consequence the stake on a good classic did not bring and is unlikely will bring club any significant success at the elite level even though the team is updated regularly with the talented youths. All that what works in youth bandy as a rule does not work in senior level at all. So Edsbyn requires new coaching ideas and attitude for what the club has to dare to go beyond their usual rustic lifestyle. Thus Västerås, Villa and SAIK today are big three in swedish bandy that will determine fashion for the coming years and reap the results. Strategically Vetlanda is close to them and should approach big trojka in the near future. The success of other swedish clubs can come only by an occasion even despite they have many top players in their squads. There are only SKA-Neftjanik and Enisej from the part of the russian teams now able to compete with the swedes, but this year they have lost competition and no one in Russia can say safely what will happen next year. If Khabarovsk tomorrow run out of money as it already happened in Moscow, Kazan and Krasnogorsk then SKA-Neftjanik suddenly become Dinamo-Moscow II and only the club that can worthly represent Russia on the world stage will be Enisej alone those stock of the strength is still quite high despite unlucky performance this year.